This recipe comes from a personal favorite, the Smitten Kitchen. I haven’t made any changes to the recipe… these are just my own personal hints for cooking on my stove. Set a square of parchment paper over a medium-sized plate. Lightly butter or coat the parchment with a spray oil, just as an added security measure. In a medium, dry nonstick saucepan with the stove on 7.5, melt sugar; this will take about 5 minutes, stirring with a wooden spoon if necessary to break up large chunks. By the time it is all melted, if should be a nice copper color; if not, cook until it is. Remove from heat and stir in butter. It may not incorporate entirely but do your best. Stir in cream and salt and return saucepan to the stove over medium-high heat, bringing it back to a simmer and melted again any sugar that solidified. Cook bubbling caramel for a few minutes more, until it is a shade darker. Pour out onto parchment-covered plate and transfer plate to your freezer. Freeze until solidified, about 30 mins. Preheat oven to 350°F. Line an 8×8-inch square baking pan with parchment, extending it up two sides. Butter the parchment or spray it with a nonstick cooking spray. In a medium heatproof bowl over gently simmering water, melt chocolate and butter together until only a couple unmelted bits remain. Remove from heat, and stir until smooth and fully melted. Whisk in sugar, then eggs, one at a time, then vanilla, and salt. Stir in flour with a spoon or flexible spatula. When caramel is firm, remove it from the freezer and chop it into rough 1-inch squares. Gently fold all but a small amount of caramel bits into batter. Scrape batter into prepared pan, spreading until mostly even. Scatter remaining caramel bits on top. Bake in heated oven for 30 minutes, until a toothpick inserted into the center comes out clean. Cool thoroughly — a process that can be hastened in the freezer before cutting into squares. Posted in Dessert and tagged caramel, chocolate. Bookmark the permalink. 1. Adjust oven rack to middle position and preheat to 425 degrees. 2. Line a baking sheet with aluminum foil and a wire rack. Spray rack with Pam. 3. Add flour into one shallow dish. In a second shallow dish, whisk egg whites until foamy. In third shallow dish, combine toasted panko, Funyuns, oil, 1/4 tsp salt, 1/4 tsp pepper, and cayenne. 4. Pound steaks 1/2 inch thick with meat pounder then pat dry with paper towels and season with salt and pepper. Working with 1 steak at a time, dredge in flour, dip in egg whites, then coat with panko mixture; lay on prepared wire rack. 5. Roast steaks until meat registers 150- 155 degrees, about 1o minutes. 6. Meanwhile, cook sausage in medium saucepan over medium heat until no longer pink, about 5 minutes. Stir in 1 cup milk and simmer gently for 5 minutes. Combine remaining 1/2 cup milk and cornstarch, then whisk into pot. Continue to simmer sauce, whisking constantly, until thickened, about 3 minutes. 7. Season with salt and pepper to taste. Spoon sauce over steak and serve. Posted in Dinner and tagged gravy, meat, steak. Bookmark the permalink. This is the recipe that came with our spaetzle maker. Plus our adaptation for cheese spaetzle. It’s pretty awesome. In a large bowl, beat the eggs until foamy. Then add the milk. In a separate bowl, mix together flour, salt, nutmeg. Meanwhile, have large pot of water with a dash of salt boiling. Add the dough to your spaeztle maker and allow the dumplings to drop into the water. Use a slotted spoon or strainer to retrieve the dumplings. Toss in butter and salt. Take the spaetzle that you’ve made above. It will take at least two loads to make all the spaetzle. After each load put the spaetzle into a casserole dish. Add 1/2 TBSP butter and at least 1/2 cup cheese. Top everything with the last 1/2 cup of cheese, and breadcrumbs. Cover and put into the oven just until heated through. Posted in Sides and tagged pasta. Bookmark the permalink. Mix everything together in a bowl. Form into patties. Grill. Eat! Posted in Dinner and tagged hamburger. Bookmark the permalink. This stuff is an excellent copycat of the “Tastefully Simple” boxed bread. Very easy to make. Preheat the oven to 350. 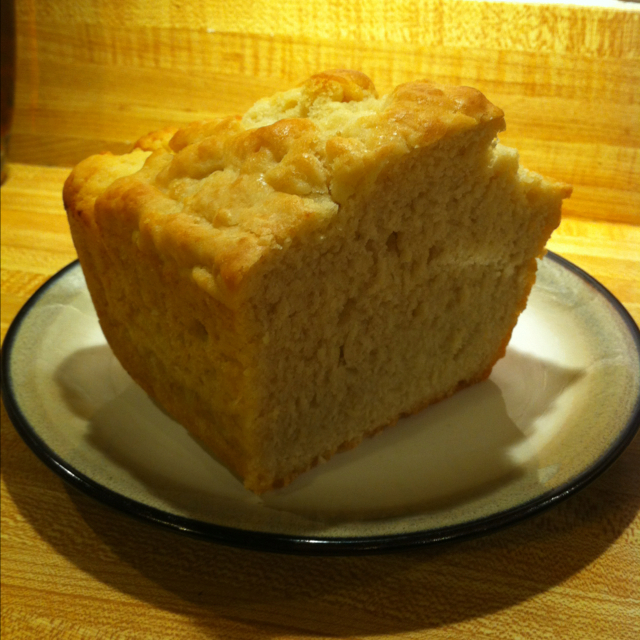 Spray a 9×5 loaf pan with cooking spray. In a large mixing bowl, sift together flour, baking powder, and salt. Stir in beer. Dough will be sticky. Pour the dough into the prepared loaf pain. Bake for approximately 60 minutes, or until the top is golden brown. Cool for about 10 minuts then remove from pan to finish cooling. Posted in Bread and tagged bread. Bookmark the permalink.